In most sales cycles, actually making the sale marks the pinnacle, and natural endpoint, of the entire process. In the world of selling cloud services, however, it’s what comes next—onboarding—that can be just as critical to boosting a provider’s bottom line. That’s because SaaS products are unique; customers won’t get the full value from their software purchase unless they activate and actually use all of the features and functionalities that the product offers. Here’s another complication to consider: The skyrocketing growth of SaaS also means that there are more business applications to choose from than ever before. That means it has never been easier for customers to switch products. Together, these factors present a stark reality for providers: If customers buy a cloud service and don’t realize the full value almost immediately, they will churn—and fast, sometimes in as little as 48 hours. If you don’t have these elements in place, the results will be hard to ignore: Poor or no onboarding leads to very low application usage. To put things into perspective, without a streamlined onboarding process, more than 90 percent of your customers won’t use the value-added services you offer, which means your company won’t get the long term benefits—including increased customer retention and lifetime customer value—that cloud services can drive. Poor or no onboarding can also create frustration and friction with customer support, which can result in dismal customer satisfaction. In our experience, we have seen poor onboarding generate a huge number of inbound support calls, which ratchets up the pressure on support organizations. Poor customer support combined with poor understanding of product value is a the perfect recipe for high churn. Fortunately, good onboarding can generate the polar opposite of these gloomy numbers and outcomes. In fact, with good onboarding, we see greater than 80 percent adoption of SaaS applications, and up to 50 percent more upsells and / or cross sells (more services, more devices, etc.). Looking beyond adoption and sales percentages, solid onboarding provides a range of other benefits. For example, onboarding is a great way to become a technology advisor to your customers. If you answer their questions before they even ask, it will go a long way toward building a trusted customer relationship. It also reduces pressure on customer support; across the AppDirect ecosystem, cloud service providers have been able to decrease incoming support calls by up to 50 percent as a result of implementing a dedicated customer onboarding process. Finally, it’s a great opportunity to get early feedback, which can help you tweak and improve your onboarding processes along the way. Our experience tells us that combining those three options will increase adoption rates while maximizing your investment. In fact, you can’t rely on all of your customers to self-serve and find the resources they need on their own (options 1 and 2). On the other hand, providing only live expert support (option 3) would be too expensive and inadequate for tech-savvy customers. With this in mind, giving your customers the choice to jump from one onboarding option to another at any point of time in their journey will help you meet their expectations while balancing your investment. From these numbers, it’s clear that the welcome email is a great opportunity to make a good “first impression” with customers. But, you have to get it right. Below I’ll share some examples of what makes for a poor welcome email and, at the opposite end of the spectrum, what goes into a good welcome email. It comes from a noreply@ email address. This sends a clear signal that you don’t want to hear from your customers and don’t want their feedback. Remember: welcome emails are not only a chance to give your customers important information, but also to hear back from them. There are messages from multiple brands (Microsoft, Telstra) with no consistency and conflicting instructions. Your communications should clearly come from your brand as the provider. There are multiple calls to action (CTAs). “Get started,” “click here to get help,” “click here for help with your billing,”—all of these are confusing to customers. Which should they do first? You should provide one message. The email doesn’t explain what to do next. The support link goes to a generic site with too much information that isn’t specific to the application that’s the subject of the email. The only contact number for help is for billing issues. This is a free trial, so the customer shouldn’t have any billing issues… unless you plan to charge for a free trial, which would be confusing. Here’s an example of a good welcome email that hits all of the right notes. It comes from Deutsche Telekom, the largest telecom provider in Germany. It comes from a “real” person at an email address that the customer can reply to and engage with. It has a responsive design, which means it can be opened and easily ready on a mobile device. It has an engaging subject line. How can you tell which subject lines are most appealing to your customers? The only way to tell is to A/B test many different options and narrow them down to what generates the best responses. 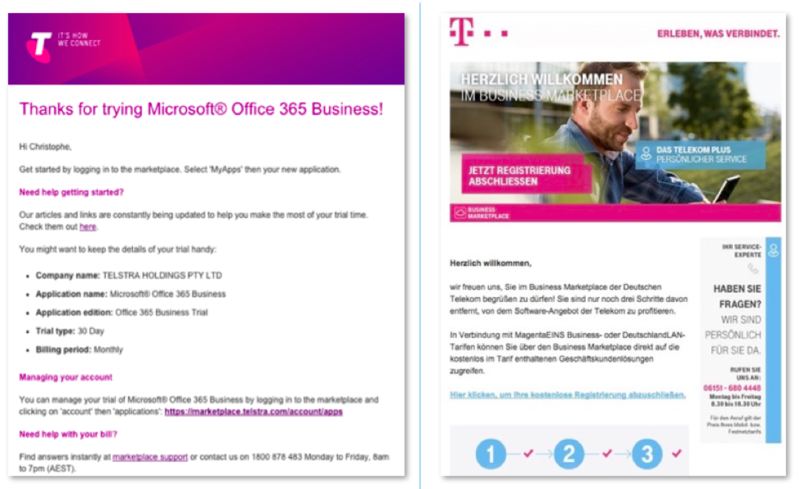 The email has brand consistency, that is, it’s clear which company is sending it, Deutsche Telekom. The email is personalized and includes the customer’s name. The email includes step-by-step instructions on what the customer should do next. It features a single, clear CTA. In addition to these elements, you should also set clear communication expectations with your customers. Let them know that more emails will be coming and when they can expect them. You also need to give your customers the ability to opt out of future communications from you if they feel comfortable enough to go it alone. App-specific content, which can include short (one- to two-minute) video tutorials, step-by-step instructions on popular features, screenshots, etc. The onboarding website as a whole should also have internal navigation links so customers don’t get lost and can easily find the information they’re looking for. Finally, the center should have a permanent, persistent section that offers options for customer support, including chat and phone-based support at a minimum. There are numerous examples of successful online onboarding centers. Let’s take a look at Canvas, a SaaS app that replaces paper forms with an application that can be filled out on smartphones and tablets. As a provider, the vast majority of your ISV partners should have this type of user content ready for you to use. If not, taking the time to work with developers to create it is a smart use of time and resources. In my next post, I’ll cover the third building block, expert onboarding, and detail the importance of expert technical support as a whole. In the meantime, if you have any questions, please feel free to reach out. We’d love to hear from you.